Poaching is fast, easy and no fuss, and if you want to serve a sauce with the fish then using the poaching liquid introduces the flavour of the fish itself. Rolled fish fillets, such as plaice or sole, can be poached in white wine or cider, which will make a lovely sauce. 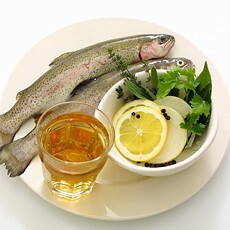 Trout can be poached in a pan of water to which a glass of dry white wine or cider has been added, along with a few sprigs of fresh herbs, a couple of bay leaves, slices of lemon, thin onion slices and a few black peppercorns. Don't bother with fish kettles, which take up far too much storage space; large, whole fish are better oven-baked in foil. The timings that follow are guidelines only, so just remember that thicker pieces of fish will need the longer times, thinner pieces the shorter. 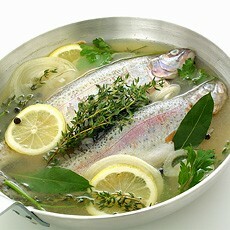 The operative word here is gentle – the liquid should barely simmer, in order not to overcook or break up the fish. Rolled fillets of sole and plaice will take 4-5 minutes, and the cooking liquid – dry white wine or cider – can be used to make a sauce. White or smoked fish fillets and fish steaks weighing 6-7 oz (175-200 g) will take 6-8 minutes, depending on their thickness. Whole trout weighing 10-12 oz (275-350 g) each will take 8-10 minutes – less for small fish. Use enough liquid to half cover the fish and make sure the pan has a well-fitting lid. Poached smoked haddock, topped with a couple of fresh, lightly poached eggs and served with some brown bread and butter, is one of the quickest and best comfort meals I know. 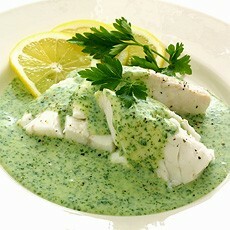 The liquid from white fish poached in a mixture of half milk and half water can be used for a parsley sauce, and the cooking liquid from smoked fish fillets poached in the same way can be used to make a basic white sauce to which chopped hard-boiled eggs and chives can be added. Either sauce can be finished off beautifully with a tablespoon of cream or crème fraîche. Like poaching, steaming is a great cooking method for calorie counters. No fat is needed, so if you're cutting the fat in your diet, steaming fish is definitely for you. You can use either a traditional fan or bamboo steamer. I think steaming – as oriental cooks have discovered – is particularly good for rolled fillets of plaice, sole or trout, as they retain their shape perfectly and remain beautifully moist. Add about 2 inches (5 cm) of boiling water to the saucepan, then fit the steamer over, making sure it doesn't come into contact with the water, and cover with a tight-fitting lid. * White or smoked fish, steaks and fillets weighing 6-7 oz (175-200 g) will take 8-10 minutes.